To visitors it is Canyon de Chelly, a scenic wonder of the Southwest whose vistas reward travelers willing to venture off the beaten track. But to the Diné, it is Tséyi’, “the place deep in the rock,” a site that many have long called home. Now from deep in the heart of the Diné homeland comes an extraordinary book, a sensitive merging of words and images that reflects the sublime spirit of Canyon de Chelly. 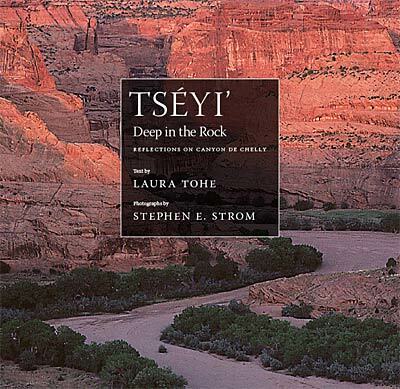 Diné poet Laura Tohe draws deeply on her heritage to create lyrical writings that are rooted in the canyon but universal in spirit, while photographer Stephen Strom captures images that reveal the very soul of this ancient place. Tohe’s words take readers on a journey from the canyon rim down sheer sandstone walls to its rich bottomlands; from the memory of Kit Carson’s rifle shots and the forced march of the Navajo people to the longings of modern lovers. Her poems view the land through Diné eyes, blending history, tradition, and personal reflection while remaining grounded in Strom’s delicate yet striking images. These photographs are not typical of most southwestern landscapes. Strom’s eye for the subtleties and mysticism of the canyon creates powerful images that linger in the mind long after the pages are turned, compelling us to look at the earth in new ways. Tséyi’ / Deep in the Rock is a unique evocation of Canyon de Chelly and the people whose lives and spirits are connected to it. It is a collaboration that conjures the power of stories and images, inviting us to enter a world of harmony and be touched by its singularly haunting beauty. When Tohe refers to Navajo history and culture. this is complemented by the visual insight the photographs convey. . . . I sense this book will appeal to those who study and meditate upon Buddhism. Reading this book is like being taken on a journey through a beautiful place by a friend who shows us the significance of each stone or river bend. . . . Poems and photos work together to become a portrait not just of place but of human connection to the land. Beautifully textured colored photographs, the rocky landscape reads as a moonscape, full of etched patterns. The sweeping landscape of mountain and canyon seems to unfurl into infinity. Wholly unique . . .ideal for conjuring the rough, bleak world of the canyon. Top Pick: Southwest Books of the Year 2005. Stephen Strom is both a research astronomer and fine-art photographer. His work, focused largely on interpretations of landscapes, has been exhibited throughout the United States and is held in the collections of the Center for Creative Photography, University of Oklahoma Art Museum, Mead Museum in Amherst, Massachusetts, and Museum of Fine Arts, Boston, among others. He has published nine books of photography, including, most recently, Death Valley: Painted Light, with poetry by Alison Hawthorne Deming and an essay by Rebecca A. Senf (2016), Earth and Mars: A Reflection, with Bradford A. Smith (2015), Sand Mirrors, with Richard B. Clarke (2012), Otera Mesa: Preserving America’s Wildest Grasslands, with Gregory McNamee and Stephen Capra (2009), and Earth Forms, with Gregory McNamee (2009). Laura Tohe was born in Fort Defiance, AZ and is Tsenabahilnii (Sleepy Water People clan) and born for the Tódích’íinii (Bitter Water clan). She grew up near the Chuska Mountains on the eastern border of the Navajo Reservation and attended both boarding schools and public schools in Albuquerque. She is the author of No Parole Today , for which she was honored as Writer of the Year for Poetry by the Wordcraft Circle of Native Writers and Storytellers. She is also co-editor of Sister Nations , an anthology of Native women’s poetry, with Heid Erdrich. Laura teaches at Arizona State University.